Excel Glogic Wheelchair. 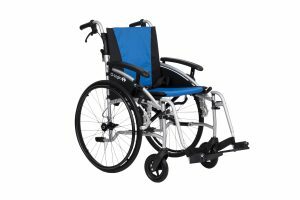 The Excel G-Logic Self Propelled Wheelchair is the next generation of G-Range Lightweight Wheelchair from Van os.. The G-Logic Self Propelled Wheelchair has a lightweight frame and comes with 24″ self propel rear wheels. The Excel G-Logic wheelchairs Rear wheels are fitted with Quick release pins, which means they can be removed in seconds making the Chair extremely easy to transport. It has a half folding backrest and swing away removable footrests which all contribute to is very small transport size and weight. Making it an ideal choice of Lightweight Wheelchair for every day or occasional use. Plus Latest model now has Brakes on the Handles making it easier for any attendant pushing the chair. Excel G-Logic Wheelchairs have a Lightweight aluminium frame with a ten year frame warranty. Choice of 4 colours for the Upholstery with an attractive Silver frame.